Whether moving engines, landing gears, wings, nacelles or any other components, you need multiple shipment options & worldwide charter services. 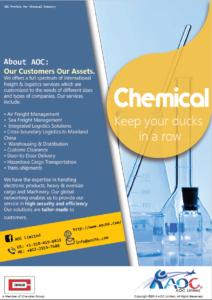 Not only handleling dangerous goods, we are experienced in time critical services. 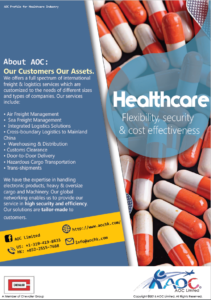 We manage the transportation and distribution through worldwide logistics centers. We avoid your obstacles by facilitating customs clearance, consolidation, monitoring shipments and providing special handling. Managing flows of components and sub-assemblies from Tier 1 and 2 suppliers for JIT delivery to OEM assembly plants. 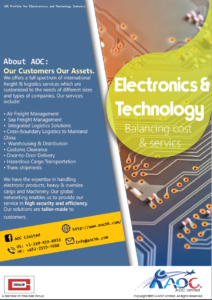 AOC provides parts consolidation, transportation and comprehensive manufacturing support, including kitting, sub-assembly, and milk run delivery. Throughout the process, you have complete part-level visibility. 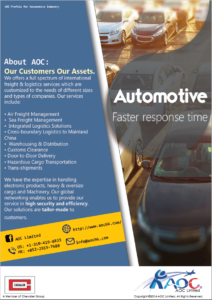 As a provider of warehouse-based logistics, AOC has the global infra-structure and expertise for distribution of aftermarket parts for the automotive industry. 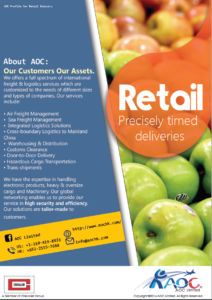 AOC provides inventory management, shipment consolidation and import/export management for manufacturers who need to distribute aftermarket parts and accessories on a worldwide basis. Providing leading-edge data integration and exception –based management tools for logistics and procurement professionals, giving complete, timely and actionable information to improve supply chain decisions. Planning and managing your retail inventory so you are ready whenever you customer are – in the most timely, efficient, agile and cost-efficient manner possible. Combining the control of local carrier and understanding of the ever-changing dynamics of overseas shipping. 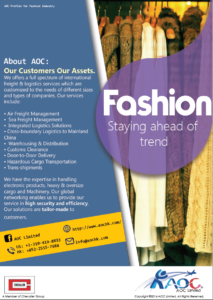 We tailor every international shipping solution for you and your customers’ specific needs. Your cargo alwremains in one container throughout the entire route and you can always track it with just a few clicks. We only select carriers with proven reliable standards for our repeat business. Competitive advantage relies heavily on your freight solutions. Our team supports a wealth of market information and aids in mode selection and leveraging negotiation positions. Our solutions result in quick ROI, with condensed timeframes and significant savings from start to finish. 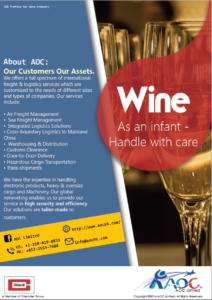 • AOC makes the subtle yet significant difference and ensures the utmost quality – logically and globally. • Opening up new opportunities for you around the world. 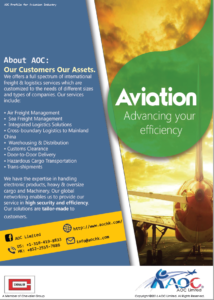 We will take care of all intercontinental air and sea freight operations, rail and road logistics for you. Every off-size shipment is carefully planned by a team of specialists who follows your shipment from pick-up to delivery and ensures proper handling at all stages. To accommodate any type of shipment on any routing.